1.) Ultra-AF : Improves the assist focus function, the max. focus distance can reach 25 meters. 580EX 580EX 580EX +NO.2 +NO.3 +NO1 . 2.) Access to Camera menu : You can set the relevant parameter of speedlite through access to the camera menu. 3.) 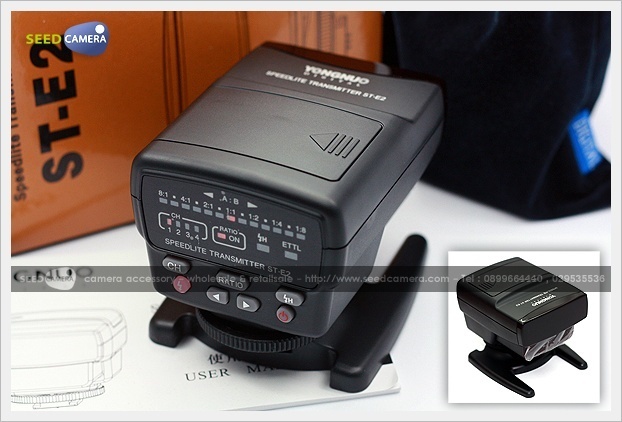 Support Exposure compensation : You can adjust the power output of the speedlite by using the flash and exposure compensation to make the photography effect meet your requirement. 4.) Support Exposure Bracketing ( FEB ) : Access to the camera menu to set the exposure bracketing function, it can help you to improve the success rate of photography. 6.) Modeling Flash : When the button of depth of field on the camera is pressed, it can control the speedlite to send out the modeling flash. 7.) Rotatable : You can control the angle scope of the slave unit through rotaing the camera body ( left and right 135 degree ). This makes it easy to serve the slave unit and mett your multi-angle creative need. 8.) Overheating Protection : If the controller is used too frequently, it's overheating protection function will be triggered, the ETTL and HSS indicator will blink alternatively, and the controller will be locked. 9.) Power saving function : If the controller keep sidle for 2 minutes and then it will step into the dormancy state in order to save power, it will automatically shutdown after keeping idle for 15 minutes.